Sanderson Associates is one of more than 1,500 homes and businesses now able to access superfast speeds of up to 80 Mbps since the Flockton telephone exchange ‘went live’ with fibre broadband. Carl France, finance manager, said: “We had been struggling with speeds of less than 10Mbps at our Grange Moor base and it was becoming increasingly difficult to work effectively and efficiently. Five new fibre broadband street cabinets connected to the Flockton exchange mean that more than 1,500 further homes and businesses in Huddersfield, Wakefield and Dewsbury can now access broadband speeds of up to 80Mbps via their chosen broadband service provider. And further expansion is set to follow later in the programme. This second phase of the Superfast West Yorkshire & York roll-out will extendfibre coverage to 98 per cent of the programme area. The additional £13 million investment will bring fibre broadband speeds within reach of a further 33,000 homes and businesses across West Yorkshire and York by the end of 2018. 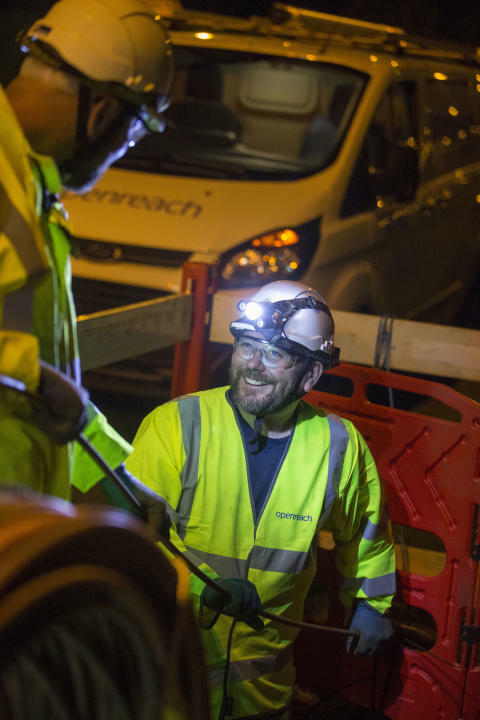 Around 850,000 households and businesses in West Yorkshire now have access to high-speed fibre broadband as a result of Superfast West Yorkshire & York and Openreach’s own commercial fibre broadband programme. It’s an ‘opt in’ service, but because the Openreach network is ‘open’, residents and businesses wanting to upgrade have a wide choice of fibre broadband providers. Bradford Metropolitan District Council, Calderdale Council, Kirklees Council, Leeds City Council, Wakefield Council, and York City Council, are working with BT to extend high-speed fibre broadband to 98 per cent of households and businesses across the majority of West Yorkshire and York by the end of 2018. In total, £34.74 million has been invested in the Superfast West Yorkshire & York programme. This is made up of Government funding from Broadband Delivery UK and funding from the European Regional Development Fund (ERDF), BT and the five West Yorkshire local authorities. Cllr Peter Box, chair of West Yorkshire Combined Authority‘s Investment Committee, said: “Providing Sanderson Associates and other companies across Flockton with access to superfast broadband is key to meeting the Combined Authority’s aim of creating economic growth and jobs across West Yorkshire and the city region.